No longer, in this day and age, can we justifiably claim to be bereft of options for interior beautification when it comes to working with space-limited and confined apartment interiors. While it may have been the case once upon a time, today we have a wealth and breadth of interior design expertise and knowhow for making the most of any space: no matter the size, shape or style. 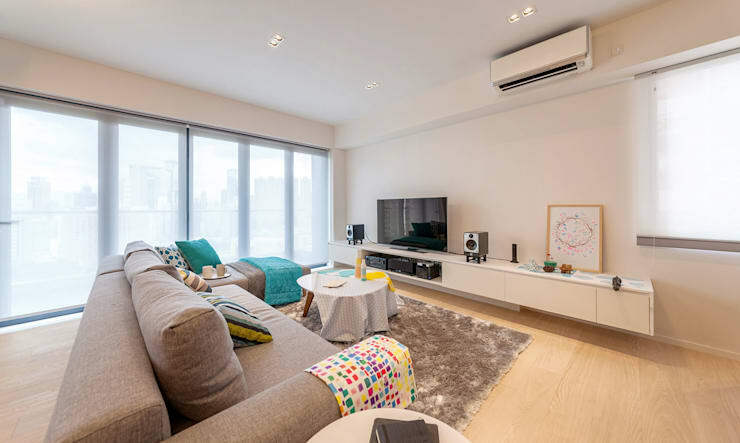 In big cities like Hong Kong, having access to ample domestic space is something that comes at a premium; while we’d all most likely have more of it than we can get, the fact is that we’ll most likely have to make a few compromises where this is concerned. The good news here is that there are so many great ways to work around and with limited space – the choice really is yours. Today on homify, we’re taking a look at how to make the most of your modest interior spaces with a look at 6 great ideas for how to furnish a small apartment, with a view to excelling the space both functionally and aesthetically. Struggling to make the most of your confined apartment spaces, or simply unsure where to begin? Take a few pointers from us: read on, get inspired, and get excited about turning your wonderful apartment into something truly spectacular. When you, your family, or guests walk into your home, the first thing they’ll see before any living spaces, social areas or tucked away rooms is the hallway. While not generally ‘the feature’ of any domestic interior, the hallway or entranceway is a necessary aspect of any home, and it ought to be given as much attention as any other space. They say first impressions last, and given its primacy in the overall domestic experience, it’s crucial that we furnish it appropriately with excellent design and logistics in mind. Entranceways can be tricky spots to keep in check, because they’re prone to generating and attracting clutter and mess (which is the last thing you want greeting you each evening, or greeting your guests when they arrive for a get together or dinner party). Having ample storage for things like shoes, knick knacks and other hallway items becomes a crucial consideration in this regard. Yet, given the confined spaces we’re working with, this sort of storage also needs to be clever too. 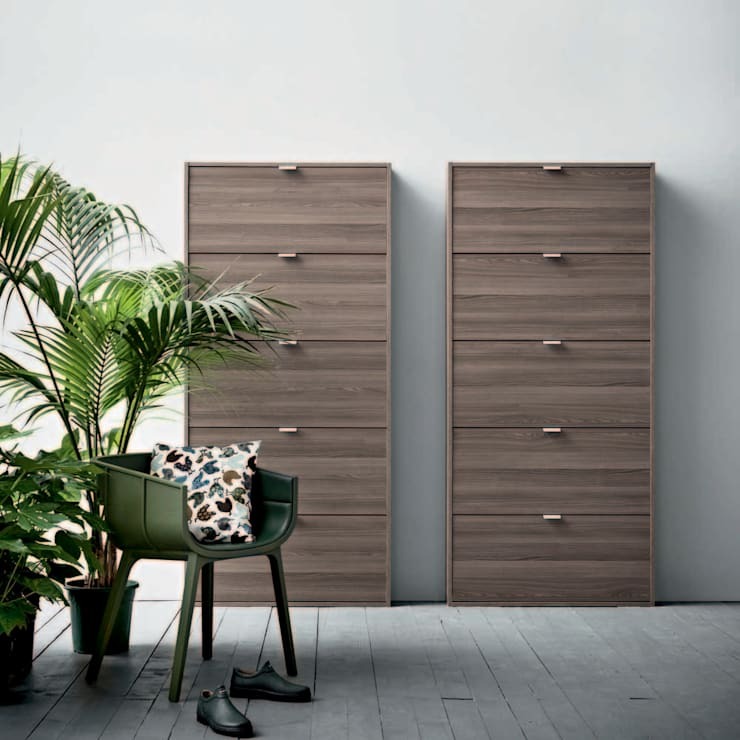 Here, we see how it’s done: a beautifully appointed interior hallway space that thrives thanks to the thoughtful and well-selected (and well-designed) inclusion of these storage units: sleek and slender, aesthetically pleasing to the eye, and slimming to an already space-conscious area. Need a few tips on how to make the most of your hallway, or any other aspect of your apartment? Why not chat to a professional to get you on the right foot? NO matter what space we’re working with, there’s no compromise for a spacious and cosy living room. Even if we happen to be living in a single room apartment, having a space to laze, kick back and relax after a long day is crucial to domestic harmony and bliss. It doesn’t take much to make a viable living room space even cosier and more appealing. This is a fine example of a space-limited apartment living room lounge area that thrives with a few neat additions: a well-selected and comfortable couch, a sleek, yet modest entertainment space, a well-appointed home entertainment system, and ample natural and evening lighting. Lovely! So too with the living room, a staple of the small apartment is having a harmonious and ultra-pleasurable bedroom. The bedroom is crucial to our day to day wellbeing, and no matter the size of our apartments, we need to prioritise this space and make it as comfortable and relaxing as possible. 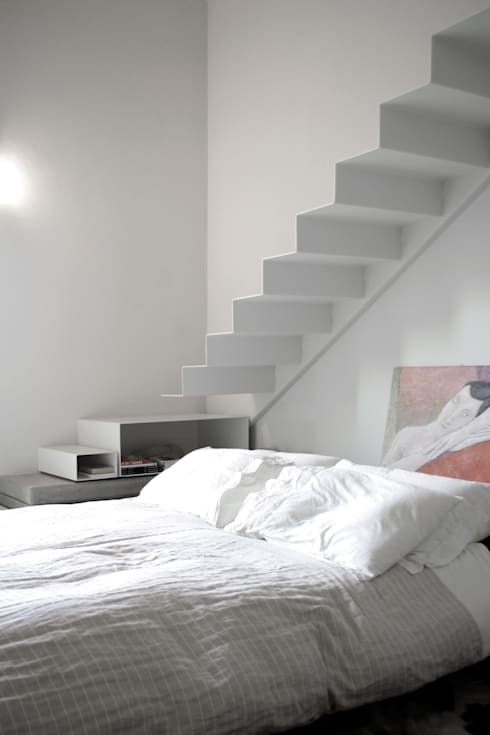 This is a bedroom we’d all love to find ourselves waking in: lush covers, fresh white sheets, a beautifully relaxing mattress, complete with Japanese modern-style staircase, giving the space a deep, restful, harmonious haven feel. While we’d all love to have a brilliantly spacious kitchen, fit for preparing monumental meals for all the guests we’d care to invite over, in a small apartment, working with less is a base reality for most of us. But there’s so much that can be done with a small kitchen space: the key is to make it as functional as possible. Keeping things open plan can be a great way of enhancing your limited apartment kitchen, while opening up the flow and feel of the rest of your living and entertainment areas too. 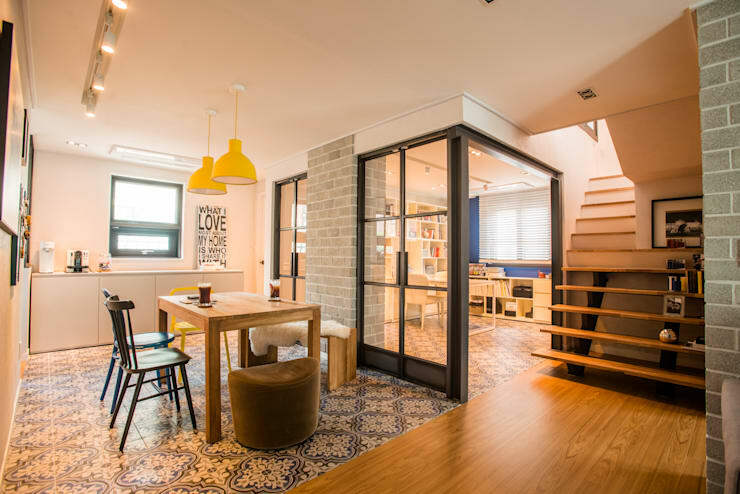 Here’s a great open place apartment set up where space is remarkably, and artfully condensed: a brilliantly, if not cosy yet highly functional kitchen that marries well with adjacent meal area and eclectic wood and tiled design throughout. When space comes at a premium, we need to get clever and crafty about how we make the most of what we’ve got. Staircases can be a space-saving wonder, whether it’s through introducing new storage areas, cabinets and shelving, or indeed constructing brand new rooms! 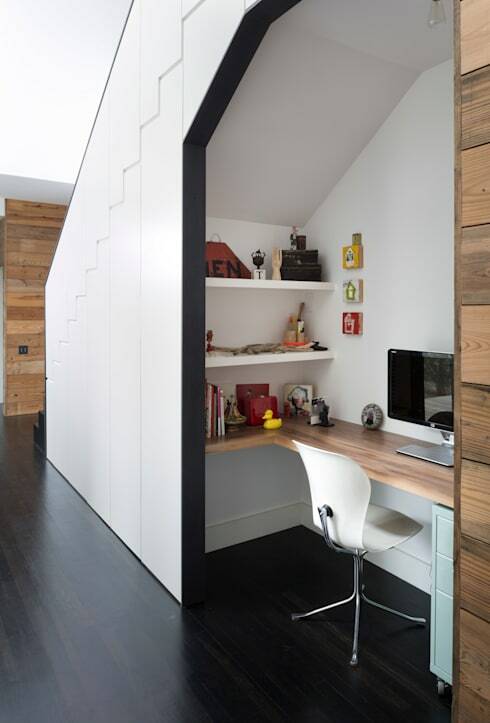 Consider this fabulous apartment addition: a previously un-used under-the-stair space that thrives now as a brilliant open study space. If studying isn’t your thing, make the most of the space in other ways: like a spacious pantry, closet or even a cosy reading room. 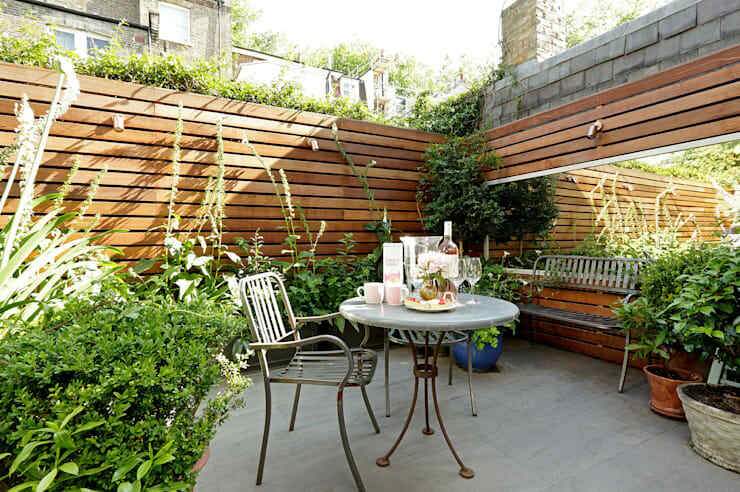 Blessed are those whose apartments are adorned with a fabulous outdoor space like a balcony, courtyard or patio! No matter how tight your confines are internally, an outdoor space means you can always entertain under the open sky and sunshine. The one thing better than a fully functional, well appointed outdoor space is one that also brings ample privacy. To make your outdoor oasis that little more liveable, functional and aesthetically pleasing, consider introducing a polite barrier between your apartment and the next with some well-designed walls like these fabulous ones here: they not only do the job well, but make the space look wonderful too. Did you enjoy that Ideabook? Why not keep the great ideas flowing with a look at Decorating a small apartment? Do you have any other great decoration tips for our readers? We’d love to hear from you in the comments section below!